Following the success of the 2013 British period drama BELLE, director Amma Asante makes a welcome returns to the genre of historical romance with her third feature A UNITED KINGDOM. 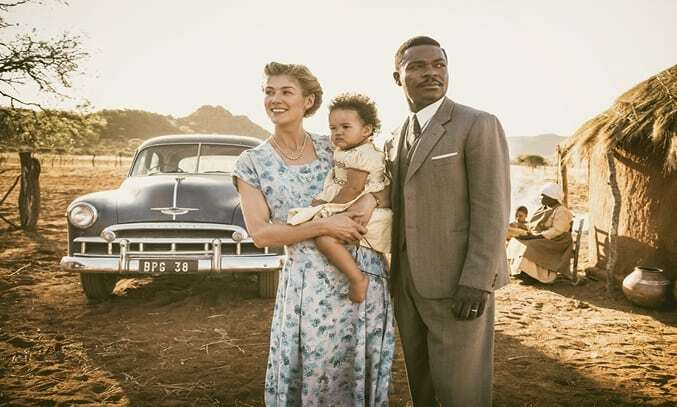 Based on a true story, A UNITED KINGDOM tells the tale of Seretse Khama (David Oyelowo), the Prince of Bechuanaland who causes an international stir when he marries Ruth Williams (Rosamund Pike), a British white woman in the late 1940s. The story begins just after World War II at a missionary society dance in London. On a spontaneous night out with her sister Muriel (Laura Carmichael), Ruth’s gaze meets that of Seretse Khama, a young African who is studying law in London. Seretse is the next in line to rule the people of Bechuanaland (now known as Botswana) and despite their cultural differences, the pair quickly fall in love and marry. As expected, an interracial marriage in the 1940s does not go down well and the couple face fierce opposition from both of their families. To complicate matters, Great Britain is also fearful that unrest in South Africa (which has just instilled apartheid) may make the region vulnerable and put their source of Uranium in jeopardy. But it is only when the couple arrive in Betchuanaland that the gravity of the situation becomes clear. Seretse must convince his own people that his love is greater and stronger than any regal tradition, and his battle for leadership becomes ten times harder when the British government banish him from his own country, forcing him to leave his pregnant wife alone in Africa. 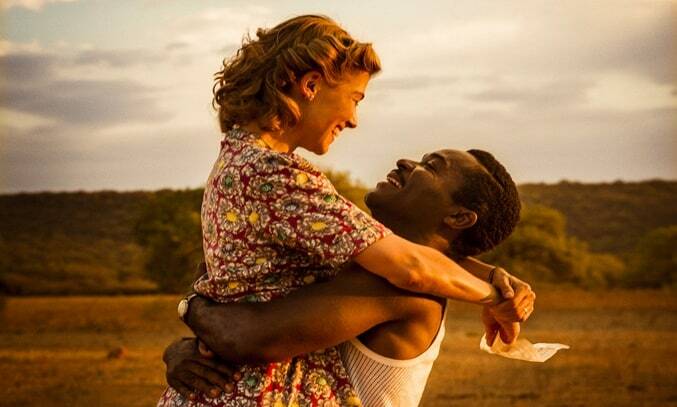 Inspirational, touching and beautifully shot, A UNITED KINGDOM is a tale of love, honour, change, and determination. Assante does a wonderful job of chronicling both the romance and the political storm that occurred as a result, proving once again that she is a mighty talented filmmaker and an engaging storyteller. The inspirational story is driven forward by a stellar performance by the cast, in particular by David Oyelowo and Rosamund Pike. Oyelowo rousing and emotionally charged speech on his return to his homeland is sure to give you goosebumps but the actor’s real strength is his portrayal of Seretse’s quieter moments, as the thoughtful and sensitive leader with the weight of the world on his shoulders. Pike is equally wonderful as Ruth, delivering a charismatic performance that is both likeable and engaging. Pike expertly conveys the Ruth’s vulnerability and inner strength and her on-screen chemistry with Oyelowo is natural and believable. While A UNITED KINGDOM for the most part makes for an absorbing piece of cinema, the story could have benefitted from some punchier plotting particularly in the middle section. While the love story is at the emotional core of the film, the majority of the action takes place during the years in which Seretse and Ruth are kept apart and as such, the emotional investment begins to falter after a while and the narrative tends to drag. On the flip side, there is also the feeling that the courtship between Seretse and Ruth at the start of the film is somewhat hurried and brushed over. Their attraction is almost too immediate and as most of their courtship is covered in montage form, when Seretse finally does propose, we aren’t fully invested in the couple in a way that we should be. That said, when the pair are together on screen, they hit all of the emotional beats and the chemistry between them is palatable. The film is also visually stunning, with Asante making the most of Africa’s beautiful landscapes, vivid colours and striking scenery to great effect. A UNITED KINGDOM may not appeal to everyone’s tastes but its stellar cast performances and inspirational true story make it a worthy choice to open the 60th BFI London Film Festival. A UNITED KINGDOM opened the 60th BFI London Film Festival on 5 October and is released in UK cinemas on 25 November.